Is Your Vyvanse Medication Too Expensive? Learn How People Are Paying A Set Price Of $50 Per Month For Vyvanse Through Prescription Hope! Are you looking for a place to get your Vyvanse medication at an affordable price? 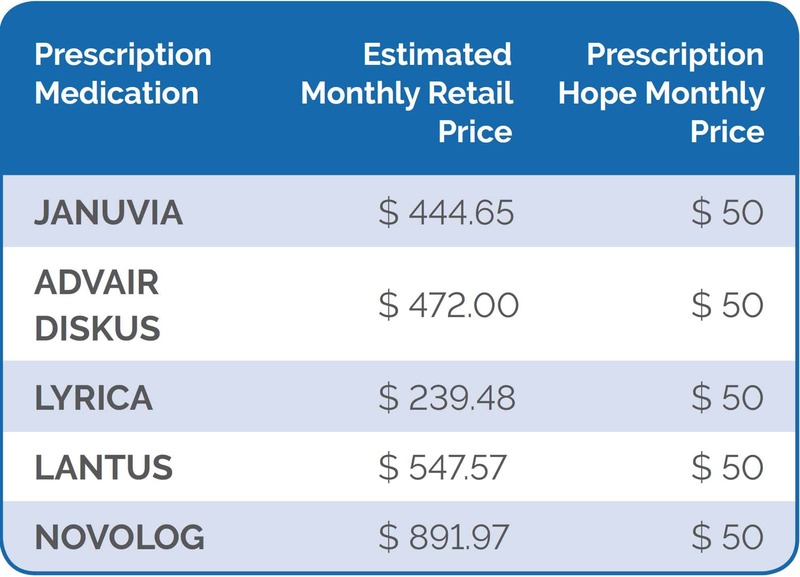 Prescription Hope offers the top prescribed ADHD medications prescribed on a national level including Strattera, Focalin XR, Concerta, Intuniv, Lexapro, Methylphenidate, Mydayis, and many more all for the set price of $50 per month for each medication! Prescription Hope works with over 180 U.S.-based pharmaceutical manufacturers patient assistance programs and their pharmacy to access over 1,500 FDA-approved medications. Our medication list includes the top-100 prescribed medications in the United States offered by big-name medication companies. There are no additional costs or hidden fees associated with the medications obtained through Prescription Hope. We will never charge a fee for any medication that we cannot access for you. Do I Qualify For Vyvanse Patient Assistance With Prescription Hope? Qualification into Prescription Hope is income based. Individuals earning up to or around $30,000 per year, households with a combined income of up to or around $50,000 per year, and families earning up to $100,000 per year may qualify for Prescription Hope. If our advocates cannot obtain your Vyvanse medication for you, we will never charge a fee for that medication. Is Prescription Hope A Vyvanse Coupon Card, Generic, Or Insurance Product? Prescription Hope is not a Vyvanse coupon card or insurance policy. This is also not a Vyvanse Generic. As a national advocacy program that works with any coverage, you may already have, Prescription Hope is a complimentary program that works alongside any coverage you may currently have. Although Prescription Hope is not a Vyvanse coupon, individuals looking for a Vyvanse coupon can find more savings through Prescription Hope! Can Prescription Hope Get My Vyvanse If I Have Insurance Coverage? Because Prescription Hope is not an insurance plan, our program works alongside any coverage you may currently have to obtain your Vyvanse medication at an affordable price. Our national advocacy program does not have medication tiers, copays, or deductibles. Every year, thousands of Americans contend with attention-deficit hyperactivity disorder (ADHD), resulting in a loss of focus, as well as trouble at both school and work. When used as part of a treatment plan, Vyvanse can allow adults to retain better focus, and live a higher quality of life. To learn more about ADHD, click here. Prescription Hope can obtain a Vyvanse discount for individuals at the set price of $50.00 per month. To obtain prescription medications, Prescription Hope works directly with over 180 pharmaceutical manufacturers and their pharmacy to obtain Vyvanse at a set, affordable price.